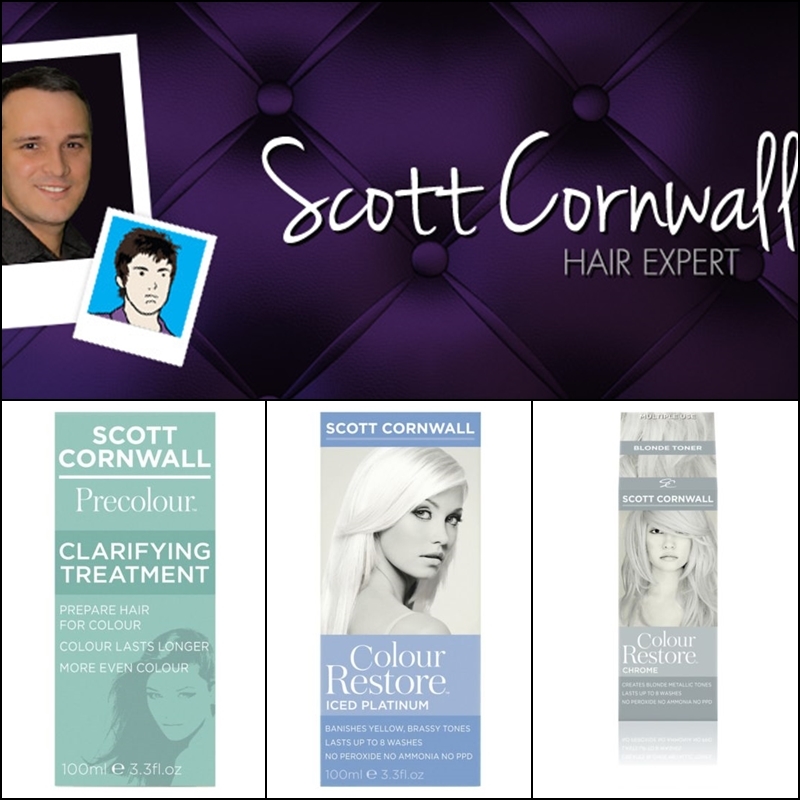 Scott Cornwall, Hair Expert with great advice and products that work. 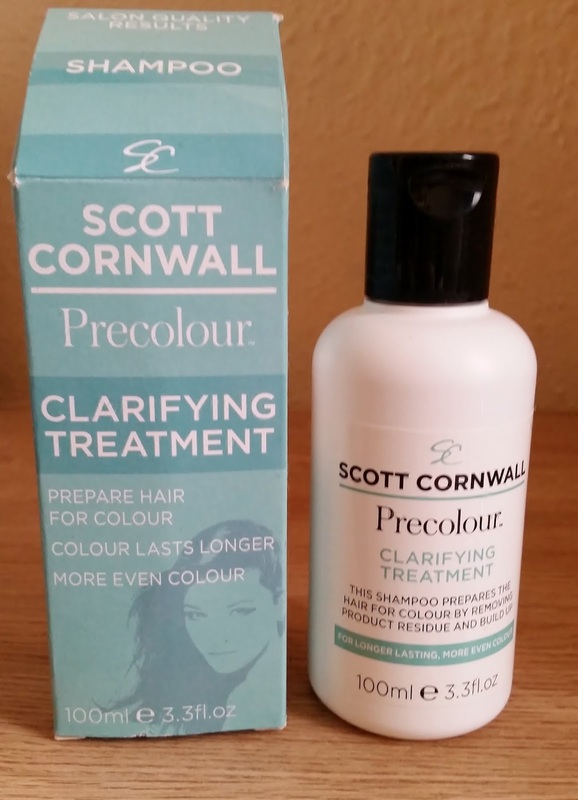 Scott's advice is worthwhile and makes any hair nightmares u might be having, made easy. If you are having a problem or just want to ask for some advice about the hair sitting on top of your head, Scott Cornwall is the hair expert to ask! His products, which are a wide selection to cater for everyone are available in shops. I first used a scott cornwall product when a colouring on my head went drastically wrong. I searched the Internet and prayed for a miracle and that's when i discovered the Decolour hair colour remover. I purchased this and read the instructions from word to word. I then applied and went through all the steps that are required. When it came to that spotlight time, when u remove the towel and see what the results will be, i was impressed! My hair was back to a natural colour it was previously. I have been a fan since then! 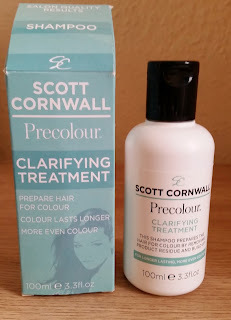 I was really excited when scott sent me his products that i could try. 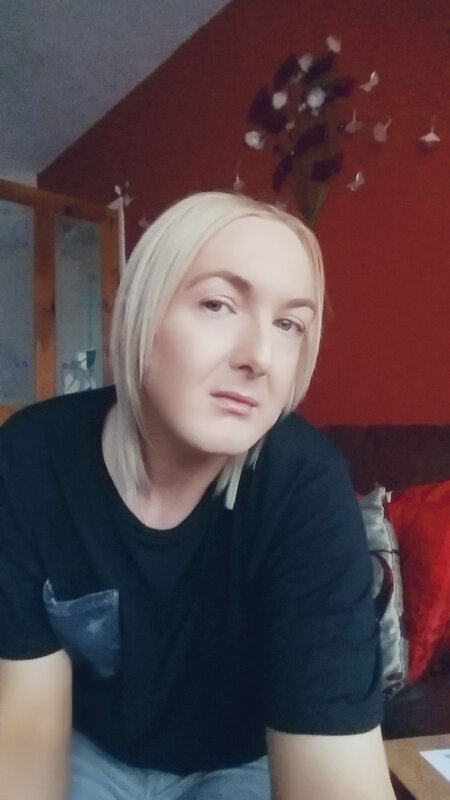 I have been blonde and use products to lighten my hair so i am in the platinum range of blonde's (quite light). Anyone who is a blonde knows that with being blonde takes upkeep and also TLC being put back into your hair that bleach and colourants can take out. Over time your new blonde hair colour fades and also can go a yellow tone which isn't good if you have spent your money and time on achieving that platinum colour. Chemical treatments can weaken the protein structure of the hair. 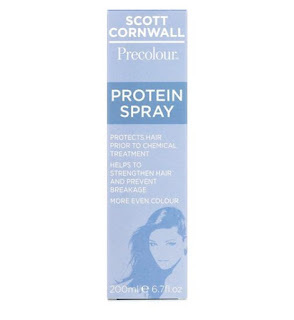 Scott's protein spray prepares and shields the hair before chemical treatments and colours, by filling in the gaps in dry and porous areas of the hair replicating the original protein structures of your hair. 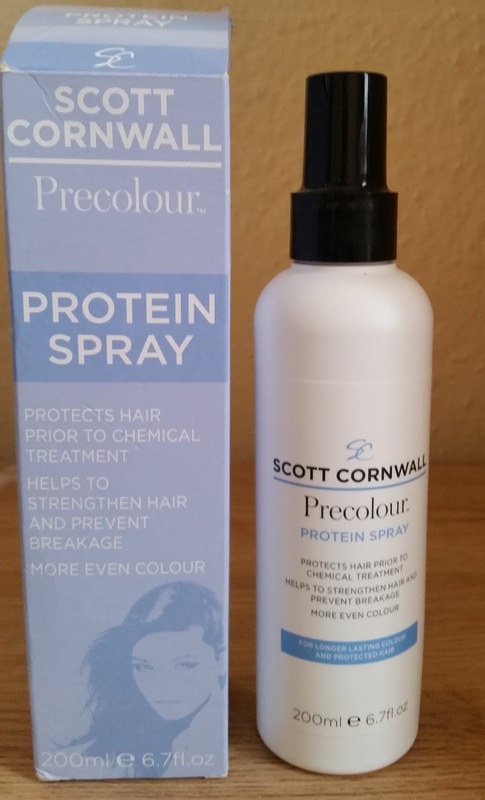 It Protects hair, minimises damage and enables an even colour result. Helps to strengthen hair and prevent breakage. This can also be used on very damaged hair as a regular post wash leave-in treatment to retain moisture and help prevent further damage. Shake bottle before use and mist spray evenly through hair. If colouring never dry protein spray after application, comb through and ensure hair feels slightly damp. Proceed immediately to colour or chemical process as instructed. So now u can feel confident when u are wanting to colour your hair that this protein spray is protecting every strand, especially when it comes to that time when your roots are coming through and they need to be coloured as Scott's advice states "You can also use on the mid-length and ends before you do bleach regrowth, to prevent breakage from the demarcation lines". 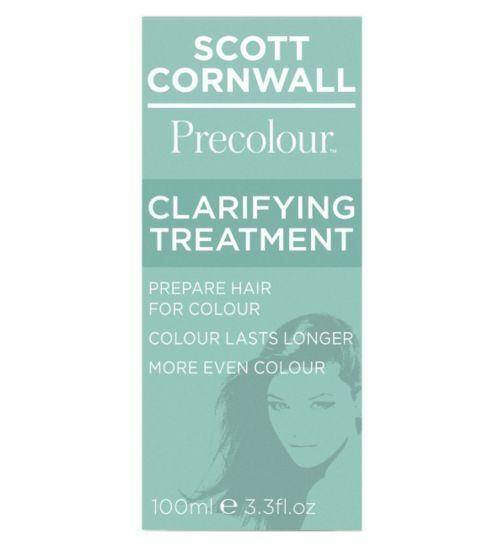 This clarifying treatment shampoo is specially formulated to remove product residue and build up for longer lasting, more even colour. This unique formulation effectively prepares the hair for colour by removing the barriers formed by rich shampoos, conditioners and styling products to enable the colour to grip the hair shaft. I have never really thought of product build up before or what rich conditioners can do but as the science and diagram on the box show, it gives u an easy explanation on why your colour might not have been achieved. As it states, product residue can smooth and the flatten the surface of the hair, closing the cuticle and blocking colour pigments. Precolour removes this coating and raises the cuticle enabling the colour pigments to grip effectively. Use before colouring hair at home or in the salon. Gently massage through wet hair and rinse well. Repeat for extra heavy residue. It states and the most IMPORTANT do not use a conditioner!! Were wanting to raise that cuticle not flatten it. "do not use the conditioner" was going to turn my hair into some dry, wet, tangled birds nest. I was wrong! This gentle clarifying shampoo was just that, gentle. My hair felt clean and smooth and i went onto the next stage of the products that was sent to me. This is an anti-yellowing treatment toner with a high concentration of violet and blue pigments, and is formulated to actively neutralise brassy blonde hair, creating pure, light white, cool tones whilst conditioning. Now this will only give you the white hair if your hair is lightened to that colour, to begin with. As this is a toner without ammonia or peroxide. 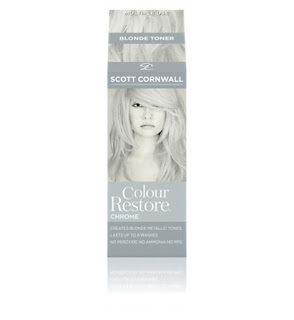 You can use this as a 20 minute intense tonal restoration or a two minute regular conditioner for tonal maintenance. I did the 20 minute tonal restoration and put my gloves on that were supplied with this. I squeezed a small amount onto my glove hand and smoothed over my washed, towel dried hair. I then used a comb to make sure all my hair was evenly covered. I left to develop for a 20 minutes and then washed this off using warm water not hot! Hot water will cause the cuticle to open and could draw the new pigment molecules back out of the hair. Throughout the washing-out stage i could feel my hair get softer and softer and my hair felt like it had been treated to a deep conditioning treatment. I left my hair to air dry and once it was dry my hair felt so soft and looked healthy but more importantly my platinum colour was back! 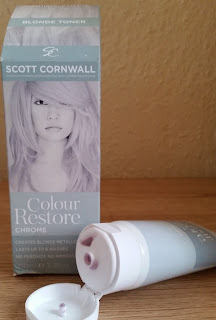 Colour restore chrome is a pure silver tone for very light blonde hair, bleached, highlighted or natural grey and white hair. Use for 20 minutes to create metallic blonde tones or as a two minute regular conditioner for chrome hues. 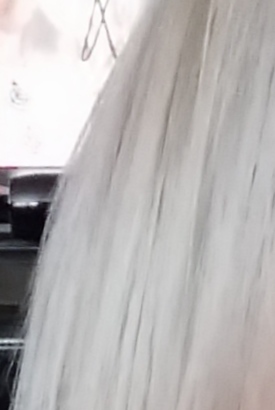 As scott advises "Chrome displays when applied to white blonde/platinum hair. 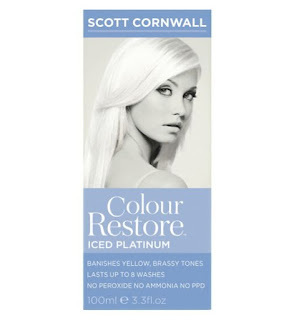 If it’s used on general yellow or warm blonde hair it will create a light ash blonde. You basically need the white/platinum hair so the Chrome displays to its full effect." I have the white platinum hair to start off with so was really eager to see what the results would be. I applied this to my towel dry hair and applied evenly all over my hair. I also used a comb for 2 minutes to make sure every strand was covered. I waited a full 20 minutes for the chrome to develop and then washed it off with warm, not hot water. 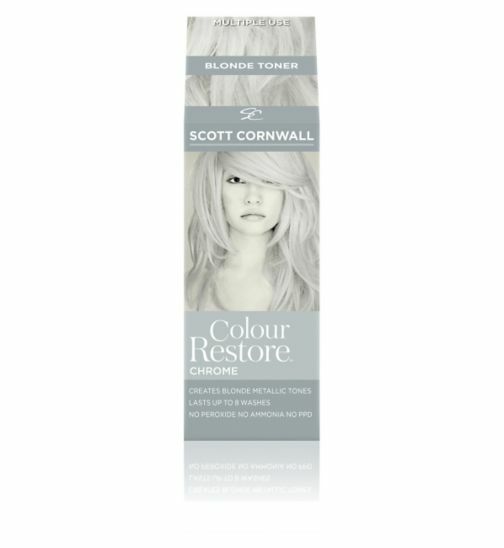 There is no need to condition as colour restore is a conditioning base and can be used as often as needed. I then proceeded to drying and styling. I was amazed at the metallic tones that were showing and present in my hair. My hair looked shiny, felt soft and the colour looked natural. I really like the chrome and this is so easy to do, if u want to join the hair trend that is grey! 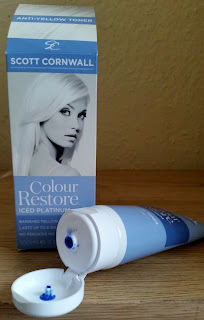 What i like about scott cornwall products is that they are really easy to use. Great information telling you if the product is suited for you and a leaflet inside each product taking you through each steps to achieve your desired hair goal. More importantly they really do work which means this is a trusted brand, when it comes to using them on your own hair. Thanks Scott for the amazing products and great advice! X Neal.